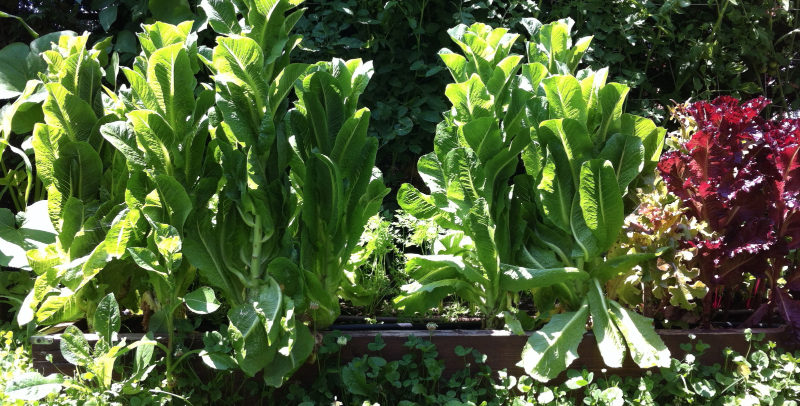 If your lettuces are starting or look like this picture they are bolting or going to seed. This means that time has come to remove them from the garden. If you try the lettuce your will notice at it has a bitter flavour, the season for lettuce is over! You have lots of other greens in your garden, you can make salads with kale, Swiss chard, beet greens. With all this summer heat it is more important than ever to make sure that your are watering. You may have to water twice. The best way to know if your are watering sufficiently is by sticking your finger in the soil and making sure that it is nice and wet below the surface. Keep an eye out for peas and beans. If is best to pick beans early and often. They are best eaten when they are young and tender. The more you harvest the more your vines will produce. 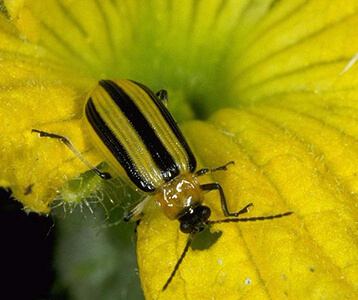 The cucumber beetle (left hand picture) have been spotted in the garden. Check your plants and destroy. You can also cover plant with a floating row to keep beetles out but make sure your have killed all beetles before covering them. Yellow sticky traps also work well on cucumber beetles. The Japanese beetle is also out (right hand picture). 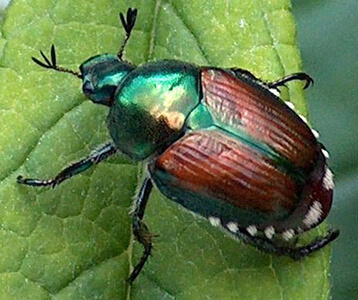 This beetle has no predator and mutiplies quickly. The best way to remedy its presence in the garden, is by going out with a yogourt container with water and little bit of soap. Luckily this beetle is slow, just shake the branch over the bucket. The tomatoes are growing. Make sure to wrap the tip of the tomato into the trellis every week. Watch my video to learn how. With sufficient water your garden will explode with this heat! Happy gardening!